Head of the Petro Poroshenko Bloc faction Ihor Hryniv told his fellow faction members on Thursday that he is leaving his post, Deputy Head of the faction Serhiy Berezenko said. 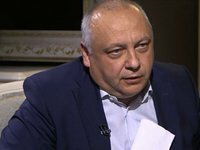 "Ihor Hryniv decided to leave the post of the faction leader and he made a relevant statement in our inner circles, this has happened today," Berezenko said during the "Left Bank with Sonia Koshkina" talk show on Channel 24 on Thursday evening. According to him, Hryniv announced his decision at the council of the faction on Thursday. "Ihor Hryniv will now focus on his work as an adviser to the president of Ukraine for strategic issues," Berezenko said. There is no decision yet on who will replace Hryniv as the faction head.